Painting, sculpture, assemblage,installation art, public art, digital printing, woodblock printing, found object art, drawing, photography, printmaking, public speaking, writing, public speaking and university lecturing. 1977-1979 Victorian College of the Arts, Melbourne, Victoria, Australia. 2018 Finalist BAM Inaugural Art Prize, Thom Gallery Byron Bay NSW. 2015 Appointed Associate Editor for the International Journal of the Image. 2014 Appointed Associate Editor for the International Journal of Climate Change: Impacts & Responses. 1976 Xavier College Open Art Award Melbourne Victoria Australia. 1976 Cann River Open Art Prize, Gippsland, Victoria Australia. 2017 The International Journal of Social, Political and Community Agendas in the Arts, Volume 12, Issue 2. “An Artist’s Vision of Environmental and Economic Sustainability for Indigenous and Non-Indigenous Artists”. 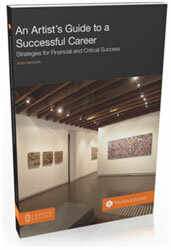 2009 “Art Insights” – Creating Wealth as an Artist. John Dahlsen. Feb – May 2019 John Dahlsen: Chung Tian Gallery, Priestdale, Brisbane. 2018 Bermuda Turtle Project 50th Anniversary Auction; Bermuda Zoological Society, Bermuda USA. 1980 Studio Works, Artist’s London Studio, England. 2018 BAM Inaugural Art Prize, Thom Gallery Byron Bay NSW. 2018 “Plastics Washed Ashore” – Joint exhibition with the Cape York Pormpuraaw Indigenous artists, in Feb/March at UPG inWoolloongabba QLD. 2018 Indonesian Institute for the Arts. Together in collaboration with students from ISI, created a large installation titled “Waste to Art”, exhibited at Alila Seminak and the Indonesian Institute for the arts Bali Indonesia. 2015 The Bays Precinct Discovery Day Sculpture exhibition. Sydney April 2015. 2013 The Art of Sound Exhibition Caboolture Regional Art Gallery October 2013. 1998 Thursday Plantation Sculpture Show, Ballina, NSW Australia. 1997 Frame Slaves Gallery, Sydney, Australia NSW Australia. 1996 Frame Slaves Gallery, Sydney, Australia NSW Australia. 1979 Victorian College of the Arts Graduates 1979, VCA Gallery, Melbourne. VIC Australia. Indonesian Institute for the Arts (ISI). Denpasar Bali Indonesia. Time Magazine: Marine Debris: World Oceans Day, June 8th 2016. Rochford Street Review: Issue 15 July – September 2015. A Journal of Australian & International Cultural Reviews, News and Criticism. Mark Roberts 11 August: The Juxtaposition of Beauty and Ugliness: Sara Khamkoed Discusses John Dahlsen’s Session at the Byron Bay Writers Festival. CDU Enews – Issue 3 – 7 April 2015. The New York Times. January 28, 2014, page D6 ART – Gyre: The Plastic Ocean. Anchorage Museum, Anchorage. Guardian Environment Network Tuesday 2 July 2013Alaskan beaches blighted by up to tonne of garbage per mile. Carl Safina for Yale Environment 360. The Earth is our Canvas.- Book – Children Caring for our Environment. Young Imm Kang Song Ph.D.
West Australian – David Bromfield, 6 January 1986. 2018 – “Waste To Wealth” video production. Indonesian Institute of the Arts Denpasar Indonesia. 2001 – Channel 9 Gold Coast 20 sept.
1986 – Radio GNR, 19 Oct, Ruth Morgan. 2018– Addressed two symposiums “Waste as Art”in both Seminak at the Alila and in Lombok at the University of Mataram. 1990 – 2017 – Lectured and appeared at various secondary and tertiary institutions as well as giving artist talks in Australian Regional Galleries as an invited artist. Curator of exhibitions and invited judge of art awards and prizes. 2000 – Powerhouse Museum Sydney. 2015: Registered to be an Independent Assessor for the Australian Federal Government Ministry for the Arts Register of Independent Assessors. 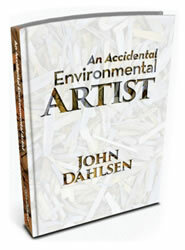 Dr. John Dahlsen studied art at the Victorian College of the Arts and at the Melbourne College of Advanced Education. He completed his PhD at Charles Darwin University in 2016 and was awarded with his graduation in 2017. Nationally regarded in Australia, as an award winning artist, he won the prestigious Wynne prize at the Art Gallery of NSW in 2000 and was selected as a finalist in 2003 and again in 2004. In 2006 he was a finalist in the Sulman Award at the Art Gallery of NSW. He has won several grants from various funding bodies, as well as winning other significant acquisitive and non acquisitive art prizes. He has lectured at many Australian and international universities, and has been an invited keynote speaker at architectural and environmental symposiums both in Australia and Internationally. For over 30 years he has been holding regular solo exhibitions of his work, both in capital cities, in Melbourne at Australian Art Resources and in regional areas of Australia, including the Gold Coast City Art Gallery, the Coffs Harbour City Art Gallery, Grafton Regional Art Gallery and Tweed River Regional Art Gallery, as well as internationally, where he exhibited at the Australian Embassy in Washington D.C and later in numerous group and solo shows in the US. In late 2003 he exhibited at the Florence Biennial of Contemporary Art, and won a prestigious award for mixed media/new media. Then went on to hold solo international exhibitions in New York in Feb 2004 and in Milan in May 2004. John is also involved in many group exhibitions from year to year both within Australia and internationally. He was also in the 2004 group show “Art From Detritus” held in New York and at Gensler in San Francisco in July. 2005 saw his work in “Recent Acquisitions” at the Whippel Art Gallery and Museum in Minnesota USA. John was selected to be a cultural ambassador for Australia by an international jury, to represent Australia at the Athens Olympics of Visual Arts ‘Artiade’ Exhibition 2004. In October 2004, as a part of Sculpture By The Sea in Sydney, John’s work “Absolut Dahlsen” commissioned by Absolut of Sweden was unveiled. This artwork commission signals the first time an Australian artist has been commissioned by this company, he joins the ranks of renowned artists such as Andy Warhol, Keith Haring, Francesco Clemente and Damien Hirst, who have also been commissioned to make an artwork by Absolut. He curated as well as exhibited in the exhibition “Recycled Revisited”, at the Samuel Dorsky Museum in New York State from the 1st July – 18th Sept 2005. In September 2005, he was the artist in residence, courtesy of Jefferson City in Missouri USA, where he made a public artwork for the city. In December 2006 John was the runner-up prizewinner in Australia’s richest Art prize, “The Signature Of Sydney Prize”. John’s work is also featured in a permanent exhibition at the Powerhouse Museum Sydney called “Ecologic” – Creating a sustainable Future. December 2007 saw John feature in a permanent exhibition titled “Ecological Integrity: On the Brink” at the Ulster County Community College’s Muroff-Kotler Visual Arts Gallery in New York. In March 2008 John was an invited guest of the North Stonington Education Foundation, to work with students and to deliver a lecture at Mystic Aquarium and Institute for Exploration Mystic Connecticut USA. n September 2008 he exhibited at the Jenolan Caves Trust NSW, in the “Treasures of Seeds” Exhibition. Supporting the Global Crop Diversity Trust. In August/September 2009, he exhibited again with the “Treasures of Seeds” Exhibition at the CSIRO in Canberra. John is represented by major public and private collections across Australia, he is also in many International collections in Europe, USA and Japan. He and his art has been written about in all the major newspapers and many magazines in the form of critiques and as articles and pictorials. Radio, television and the internet, frequently interview him about exhibitions and his work as a contemporary environmental artist. 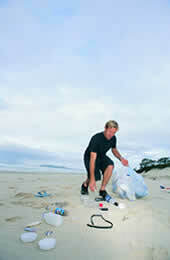 John was awarded in 2009, the Swell Sculpture Exhibition “Environmental Art Award”, Currumbin, Gold Coast, QLD, Australia. He went on to win this prize again in September 2010. In July 2010, he won the Peoples Choice Award in the ArtsCape Biennial Sculpture Exhibition. Byron Bay, NSW Australia for his 6m x 4m x 3m sculpture: “Monumental Environmental Artwork” which he made from a recycled Camphor Laurel tree root ball and trunk. In September 2010 John’s work featured at the famed “Hanmo Gallery” in Beijing’s 798 contemporary art district in China. March 2011 saw John being commissioned by the Commonwealth Bank to create a major sculpture for their new 6 star eco friendly HQ, from objects collected from the annual Clean up Australia campaign in Sydney. John was appointed ” Cultural Ambassador” for Friends of the United Nations, on World Environment Day June 6th 2011. In 2013 John was offered a PhD Candidature at Charles Darwin University N.T. Australia. 2013 Appointed Ambassador for the Nespresso Upcycle Art campaign. He exhibited his work in the 2014 US exhibition “Gyre Project” at Anchorage Museum Alaska Feb-Sept 2014. This exhibition toured to the David J. Spencer CDC Museum in Atlanta, Georgia, January–June 2015 and the USC Fisher Museum of Art in Los Angeles, California, Sept–Nov, 2015. In 2014 he was awarded the Graduate Scholar Award at the Arts and Humanities Conference Rome Italy. John was awarded a Churchill Fellowship from the Winston Churchill Foundation 2014 for artistic research he undertook in Japan and Holland in 2015. 2015/16 Received an Australian Postgraduate Award (APA). Charles Darwin University. 2015/16 Awarded the Nancy (Nan) Giese Doctoral Scholarship in the Arts. Charles Darwin University. 2017 Georgetown University USA Art For Ocean Conservation Exhibition: Third Annual Sustainable Ocean Summit. Sustainable Oceans Alliance (SOA) Georgetown Chapter On Earth Day, April 22, 2017.